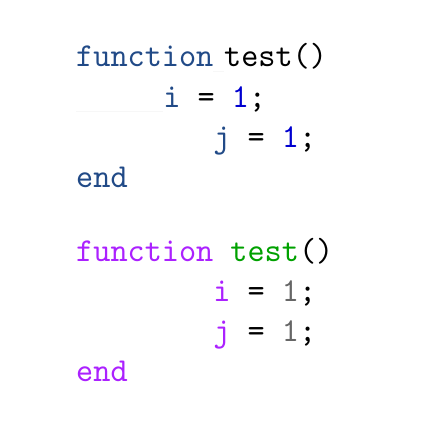 It can clearly be seen that the first line in the function using the tango style in incorrectly indented. Im fairly sure that this problem is minted-related and does not directly have to do with pygmentize, since I checked the output to HTML files and it seemed fine. The problem only occurs after the function keyword and only in the tango theme (according to my testing). Adding whitespace (i.e. spaces after the parenthesis or blank lines between the keyword and the first line) does not seem to solve the problem. Further, using spaces instead of tabs for indentation does not change the output (assuming the tabsize is equal to the number of spaces). where the red box is completely unwanted. This is however related directly to pygmentize, since the screenshot was taken from an HTML output. Still, help would be appreciated. Browse other questions tagged minted matlab or ask your own question. How to remove extra space added by tex4ht to minted listing at start of each line?